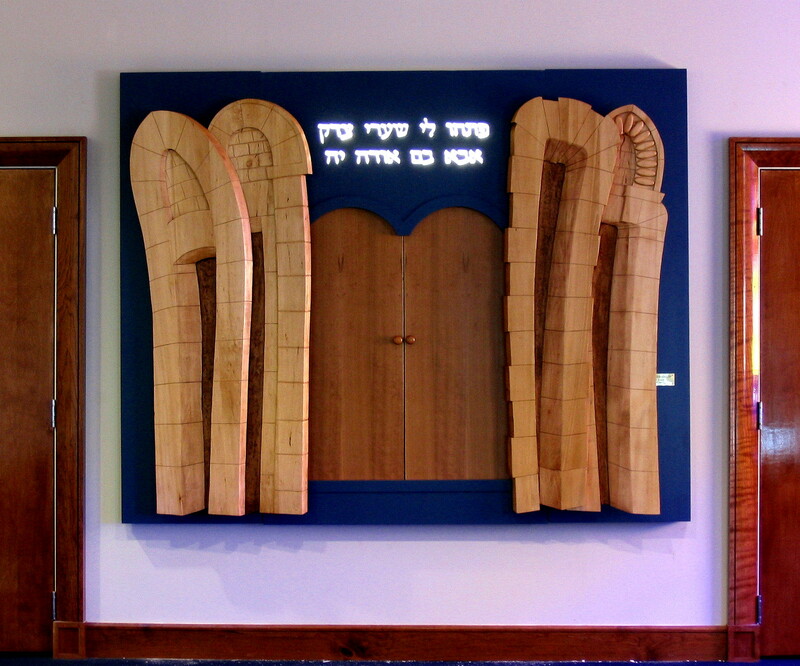 Many of these arks have been commissioned for multiple use settings—during the week, the ark serves as an art piece with Jewish references; in preparation for Shabbat and holidays, the sacred nature of the ark is revealed as doors move, panels recede, and a Hebrew inscription and eternal light appear. [Click on an image to see multiple views]. 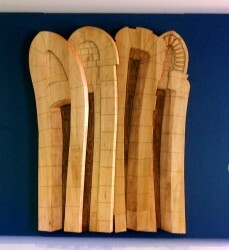 These are just a sampling of over 30 arks for which David Strauss has received national recognition. 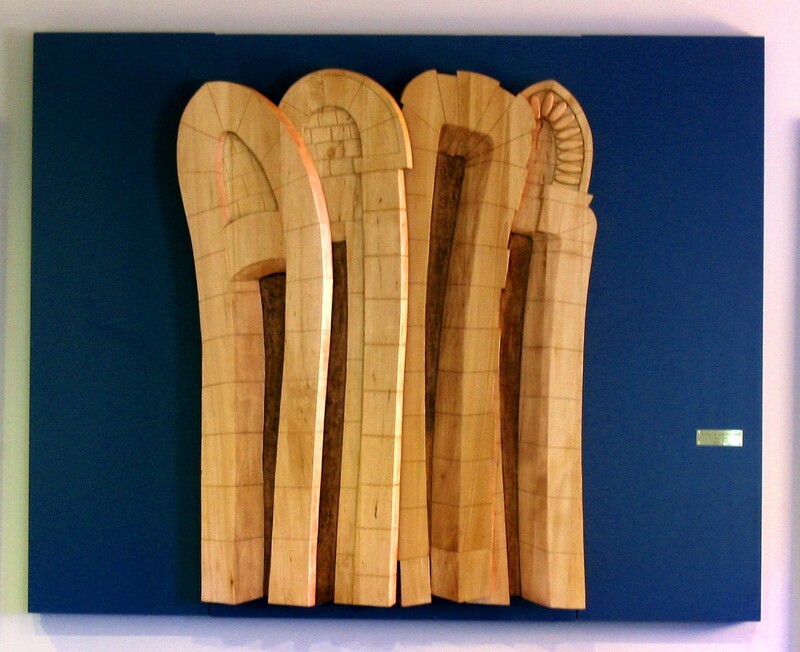 Please contact David to see a more extensive portfolio of completed ark projects. 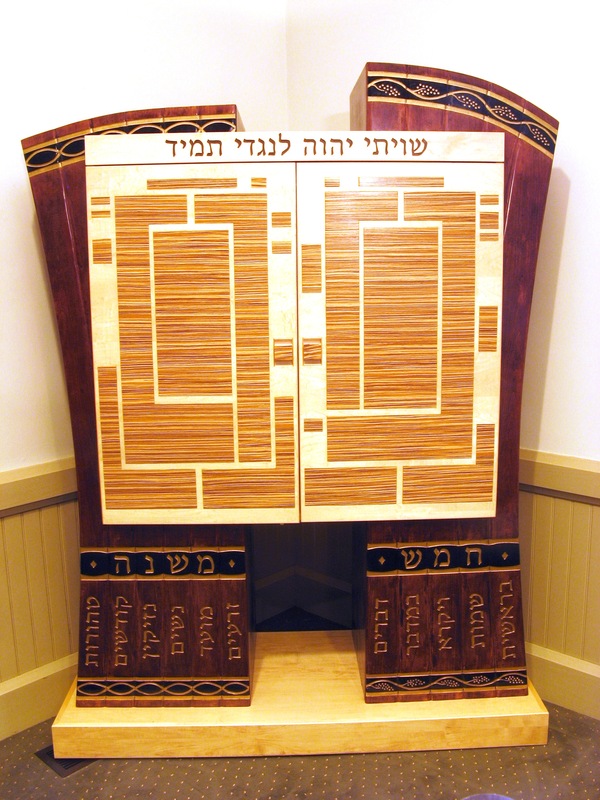 Ark for the Beit Midrash (room for study) at Brown Univ. 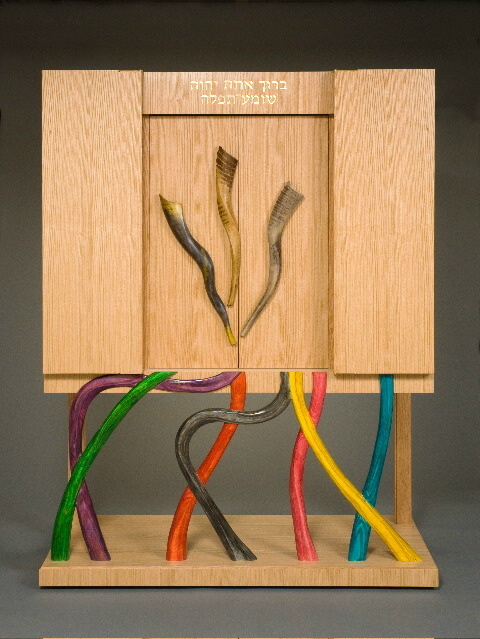 Hillel, honoring the sources of Jewish learning. 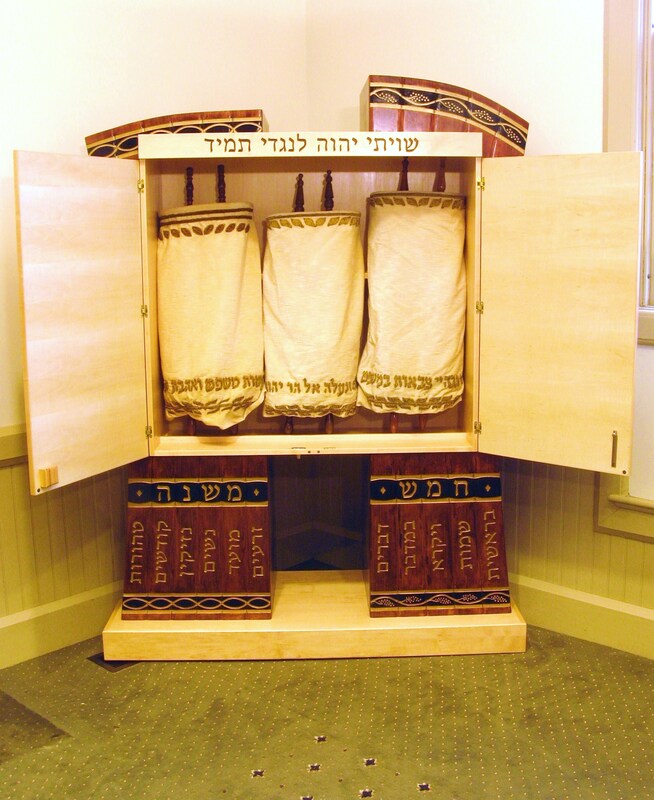 The central portion where the Torahs are stored is a graphic depiction of the open pages of the Talmud, which is in turn supported by the five books of the Torah and the six orders of the Mishnah, the pillars of Jewish knowledge on which the Talmud is based. 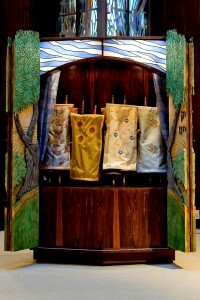 View showing the doors to the interior of the ark in open position. Through the Prism of Blessings, installed at Univ. of Texas Hillel, Austin, TX, one of 3 arks inspired by the blessings of the Amidah prayer, 9’H x 5’W. 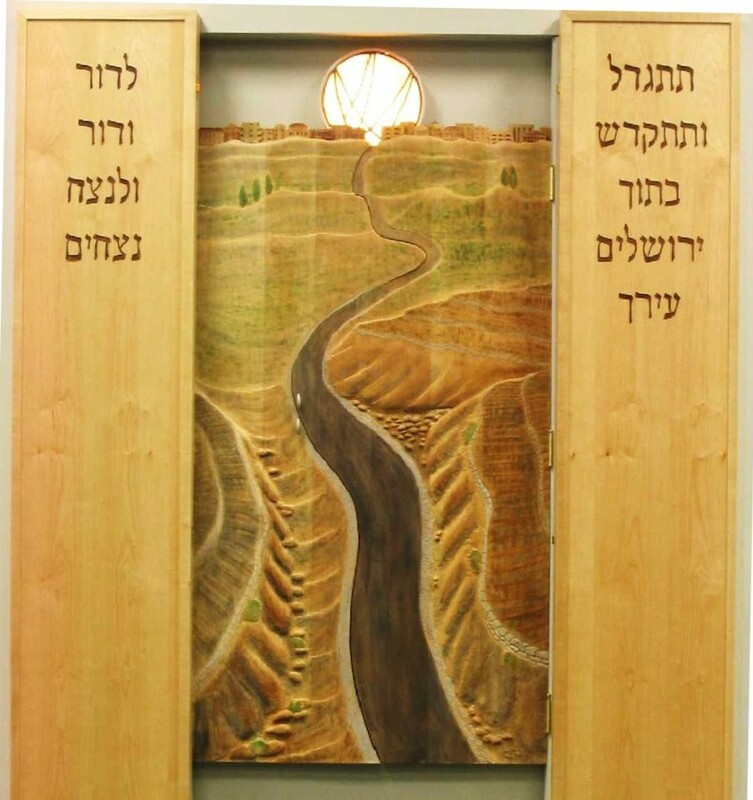 In an allusion to the ingathering of Jews that we pray for in the 10th Amidah blessing, Jews from many different individual backgrounds and traditions come together at Hillel, then branch out, spreading enlightenment from the swirling experience of their college years. 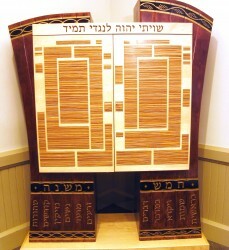 When the ark is being used for services, the words of the 16th Amidah blessing are contained in the illuminated inscription, which also serves as the Ner Tamid (Eternal Light): Blessed are you God, who hears prayer. 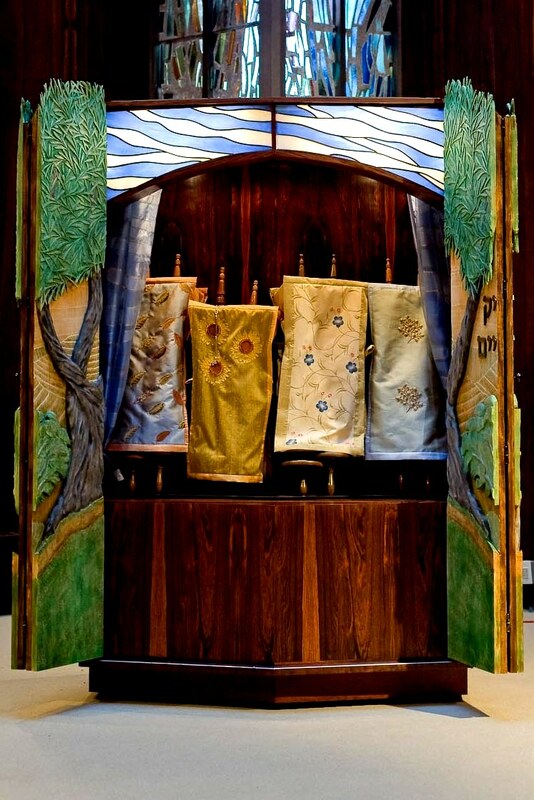 The shofars are a metaphor for our plaintive voices joined in communal prayer. 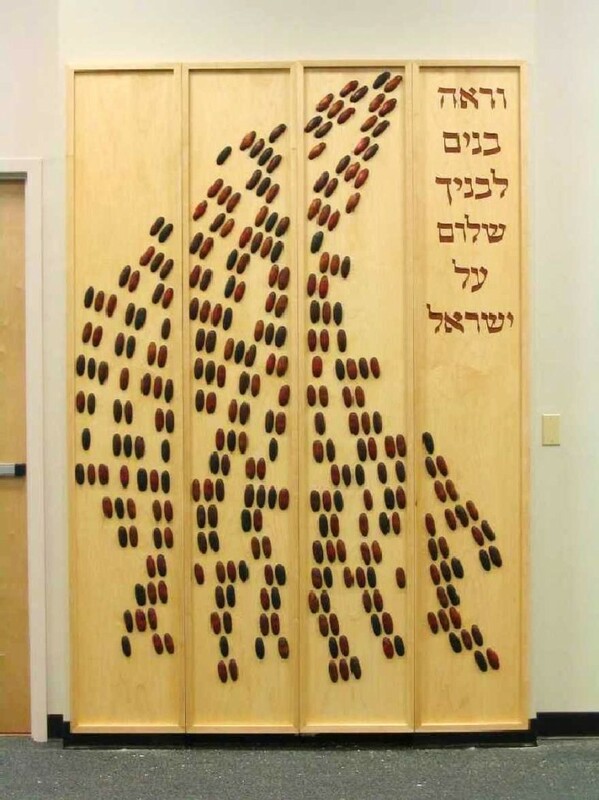 They also reflect the theme of the exterior of the ark, since in the 10th Amidah blessing the great ingathering of our people is announced by the call of shofars. 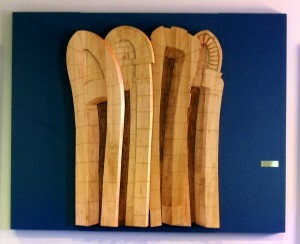 Gainesville, FL. 8’-0”W x 6’-3”H. 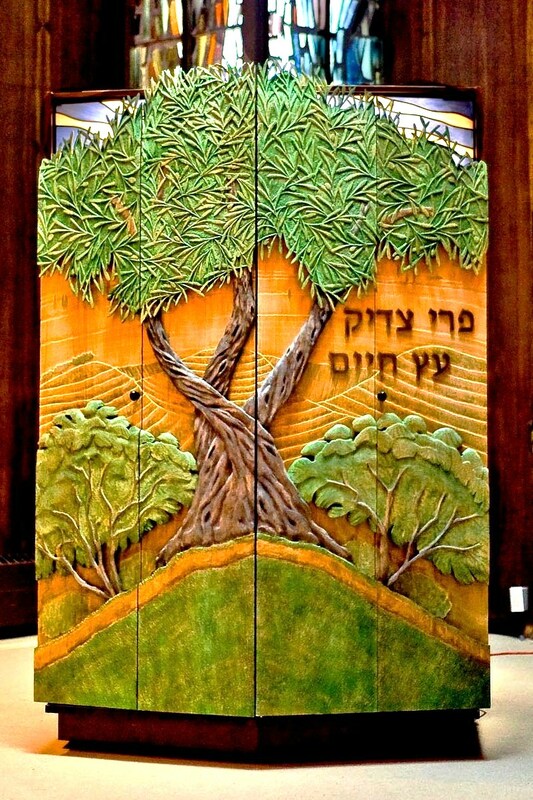 The gates are patterned on the actual gates leading from West Jerusalem to the Old City. 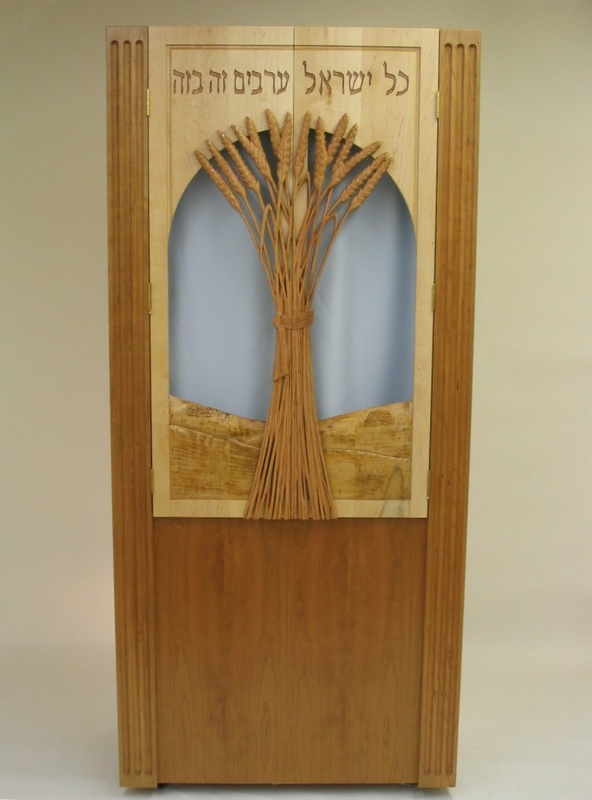 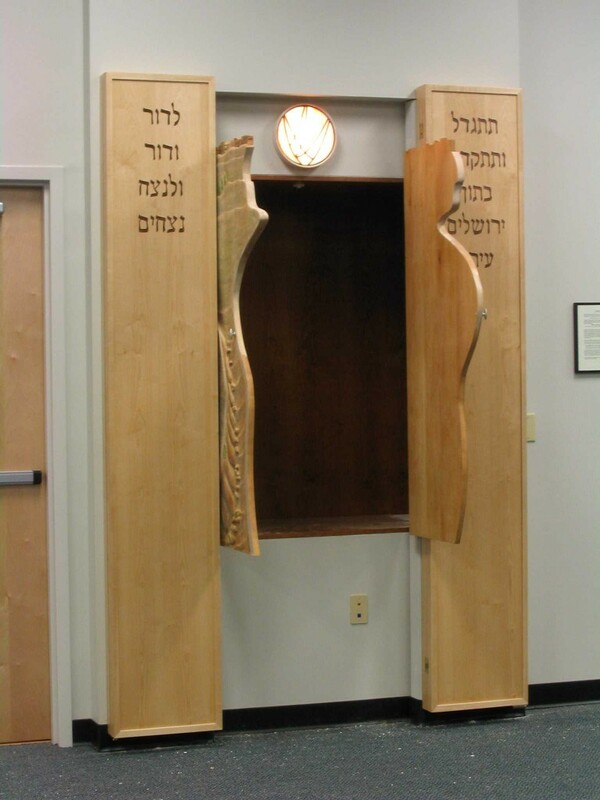 When the ark is in use, the gates are moved aside to reveal the inner ark doors and a back-lit inscription (“Open to me the gates of righteousness…” Psalm 118) that also serves as a perpetually illuminated Ner Tamid. 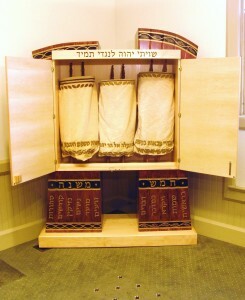 Ark at Hebrew Senior Life, Boston. 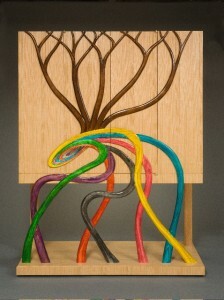 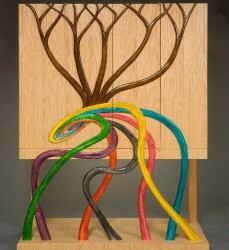 The Tree of Life is a metaphor for the teachings of Torah. 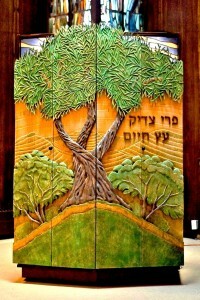 The olive tree is known for its long life as well as its association with both Biblical and present-day Israel. 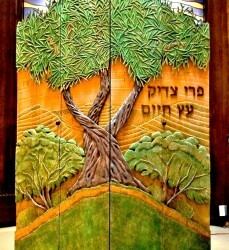 The inscription is from Proverbs: “The fruit of the righteous is a Tree of Life”. 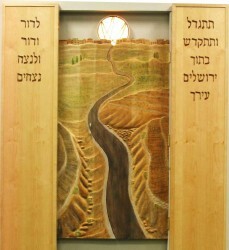 The stained glass cloud formation over the energetic Judean landscape also serves as the Eternal Light, seen in full when the Ark is opened. Portable Ark, “All Jews are Responsible for Each Other” Bab. 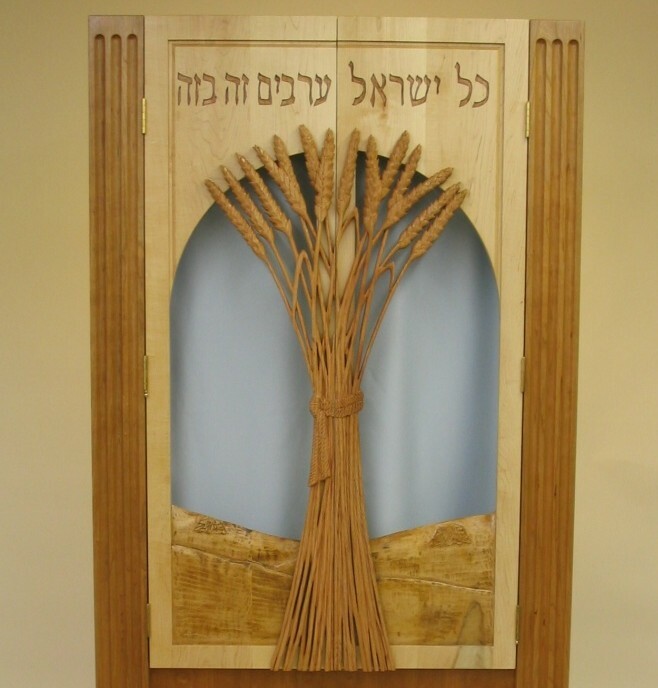 Talmud (Shevuot 39a) is illustrated with a sheaf of wheat, since the individual stalks can stand only if they are bound together in harmony. 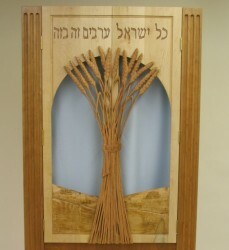 Wheat, being one of the seven species mentioned in the Torah, is especially evocative of the Land of Israel and its abundance.